PACK EXPO International, this year’s largest packaging trade show, is just around the corner, October 14th-17th in Chicago. 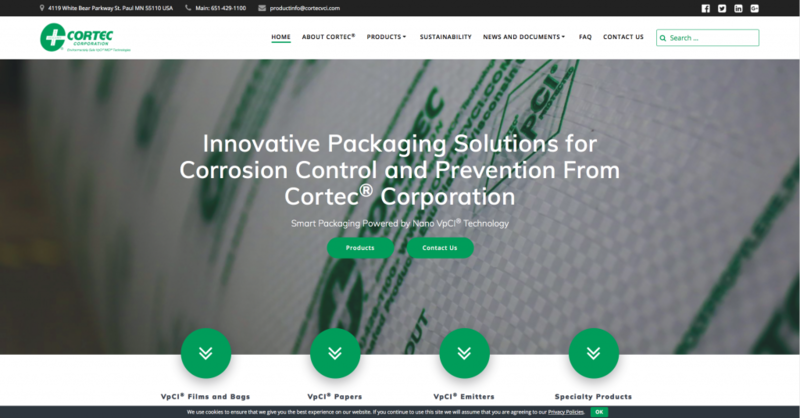 Cortec® is gearing up for the opening day with a completely new VpCI® packaging website that has a fresh look and easy to use features! Each category is further organized by product format. Rather than sorting through every product by name to find out which film, paper, emitter, or specialty product is right for them, users can drill down by product type to see what is available in each format. For example, dropdown lists show users which VpCI® films are available as roll stock, sheeting, tubing, stretch film, and bubble wrap. VpCI® paper users can see which versions are available as rolls, perforated rolls, or sheets. Individuals looking for VpCI® emitting material can browse options according to small or large volume package needs, or a desire for flexible emitters, emitter strips, or emitter cups. Specialty products open up options for absorbent material, biodegradable film, fabric, corrosion inhibiting pipe caps, recyclable moisture barrier papers, and more! Individual product pages contain information on product sizing and availability for quick reference. The website also highlights Cortec’s strong environmental concern, which translates into the manufacture of many recyclable paper and film products. Cortec’s VpCI® papers are made from neutral/natural Kraft paper (a natural plant-based resource), coated with a water-based VpCI® coating, and is easy to recycle. Cortec® VpCI® film is also recyclable, which allows Cortec® to incorporate recycled VpCI® film back into the manufacture of new films, while still achieving superior quality VpCI® performance. Cortec® reprocesses VpCI® film scrap and incorporates the “repro” back into the virgin film at up to 20 percent, a level at which Cortec® can ensure quality of the new product. Cortec® has expanded its film reprocessing program to allow customers to send their used VpCI® film back to Cortec®, creating a win-win-win situation for customers, Cortec®, and the environment. Instead of paying thousands of dollars for disposal, customers can now send used VpCI® bags to Cortec®, who pays shipping and gives customer credit in exchange for the benefit of having an additional source of repro. Both customer and manufacturer demonstrate environmental responsibility and reduce their carbon footprint in the process. The program will save tens of thousands of dollars and tens of thousands of pounds of plastic annually. The new website also includes a page dedicated to frequently asked questions for those wondering more about how VpCI® packaging works, how to use it, and how long to use it. Anyone looking for more information on sizing and lead time or specific product details can visit the “Contact Us” page to connect with the appropriate sales representative from their region of the world. Other helpful links will include information about upcoming trade shows, case histories, and customer feedback. The Cortec® VpCI® packaging brochure has also been freshly updated to mirror the new packaging website. Like the website, this helpful handheld guide categorizes Cortec’s packaging products according to VpCI® Films and Bags, VpCI® Paper, VpCI® Emitters, and Specialty Products. A product selection guide is included for each category so users can mix and match from a wide variety of products to select the best packaging solution for their needs—whether that is small package protection with VpCI® papers and emitters, layup of heavy-duty equipment with wide format MilCorr® film and VpCI® pouches, protection of pipe ends with CorrCap VpCI® protective covers, or simply moisture barrier protection with one of Cortec’s specialty recyclable water-based moisture barrier coated papers. Cortec® is eager to greet PACK EXPO visitors with these new resources to make VpCI® packaging products more accessible and understandable, bringing a unique perspective to the show through Cortec’s emphasis on metals preservation. Not only does Cortec’s packaging provide corrosion protection to metals; it is also available in both small and impressively large formats. This versatile product range allows the protection of small freshly-manufactured metal parts as well as massive industrial equipment that needs long-term preservation during layup or prior to commissioning. Previous: Previous post: FEATURED IN: Riding the Coat-Tails to Greener Packaging Featured in Canadian Packaging Magazine! Next: Next post: Plastic News Europe features EcoCortec’s second production plant opening!